Mark Tulloch, of Kettering takes aim in a firearms training simulator Wednesday at the Clark County Fair in Springfield. The county sheriff rented the simulator to offer as a free exhibit, hoping it will help the public better understand how quickly officers must decide whether to use lethal force. SPRINGFIELD — When the gunman showed up at the hospital, Mike McDorman raised his handgun, took aim and shot the guy. He did the same when an impaired driver stepped out of a vehicle and aimed his way. Then, having dealt with a handful of these tense scenarios in just a few minutes, he handed the gun back to a sheriff’s deputy and walked out of the police shooting simulator with a relieved smile. 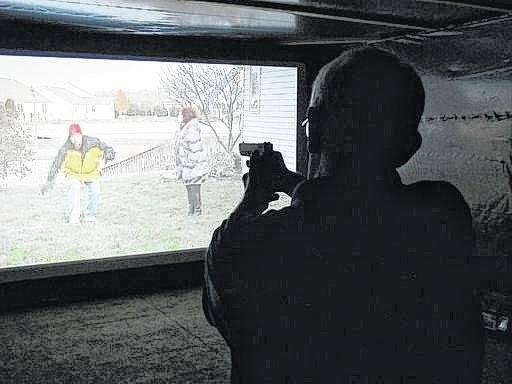 McDorman was among dozens of people who took aim in a firearms training simulator placed at a county fair by a sheriff who hoped to help citizens better understand how quickly police must make life-or-death decisions. Some participants saw value in the exercise as police around the country face increased scrutiny for shootings, especially those involving unarmed black men. That’s the educational effect that Sheriff Deborah Burchett hoped for when she rented the simulator to offer as a free exhibit at this week’s Clark County Fair. Her staff built a darkened room for it, right between booths for a golf cart raffle, an anti-abortion group, a cellphone company and the National Guard. The operators estimate that at least a couple hundred people tried the simulator in the first three days, plus deputies, local officials and fair officials who took turns before the fair opening each day. Participants see realistic scenes such as school shootings and domestic disputes projected onto a screen from an officer’s perspective. Participants hold a modified gun that shoots air, and a computer tracks their shots at the suspect on the screen, showing splatters of red when one is hit. Seeing a kill shot in her second try on the simulator left 30-year-old Melissa Tuttle wondering how she’d react if the situation were real. “I don’t know if I could walk home that night and be OK,” said Tuttle, a former defense attorney and now county clerk whose father was a sheriff’s deputy. For civilians, she said, the simulator seems to be a deterrent to after-the-fact armchair policing in real life. Frank Robinette noted he’d have ended up dead after reacting too slowly in one scenario. The 50-year-old gun owner from Springfield called it a big eye-opener. “I’m glad I didn’t become a police officer,” he said. The sheriff’s office says participants’ responses to the exhibit have been almost unanimously supportive, aside from a few teenagers’ complaints about not being allowed to try it. Burchett limited it to adults out of concern about how it might affect youngsters. Burchett said she thinks it’s worth every penny of the $3,000-plus she paid to rent the equipment from Tactical Edge Protective Services, a Warsaw, Indiana, business run by an officer who mostly rents the high-tech equipment for law enforcement training. Participant Scott Greene, a 30-year-old Springfield insurance agent, saw value in it, too, in the context of police shootings making headlines around the country. He said officers sometimes make mistakes, “but it’s very easy for people to say this is how I would have acted.” Going through the simulator, he said, shows it might not be that simple.